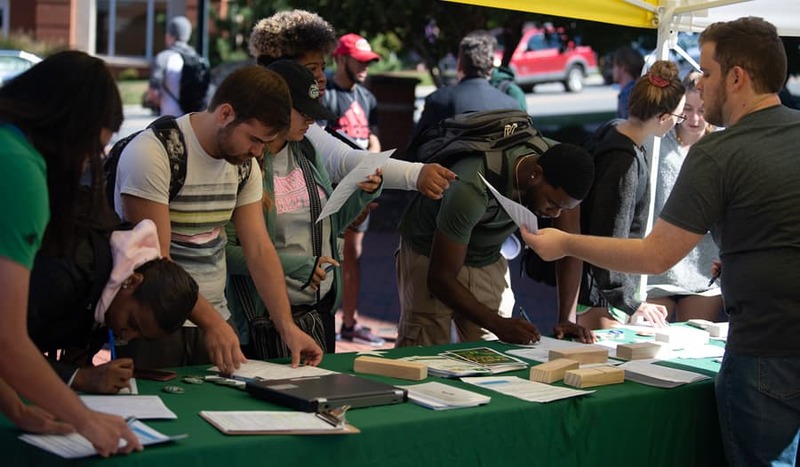 UNC Charlotte’s 49er Democracy Experience once again took the lead to communicate with students about the importance of voting in advance of Nov. 6 elections. The semester’s largest registration event, #JoyofVoting, created a festival-like atmosphere where students played games, enjoyed free food and talked about the political situation; 49er Democracy Experience also registered 230 students to vote. “We do all we can for student voting; that means everything from student registration, to educating students, to taking them to polling sites,” said Mark Sanders, senior lecturer of philosophy. The 49er Democracy Experience team did not stop at student registration. Through countless efforts such as tabling, tweeting, classroom presentations and talking to students, 49er Democracy Experience volunteers motivated more than 1,000 students to sign up with TurboVote. These students received electronic notifications about the midterm and primary elections. “Party at the Poll,” the 49er Democracy Experience’s most recent event, provided student transportation to the nearest polling location. During the early voting period, Oct. 29 through Nov. 2, 92 students were shuttled to the polls. “This semester, we really made a difference. Our events were fun and informative; we increased student voting in ways I have never seen done before,” said Toni Lane, public relations director, 49er Democracy Experience, and a senior who is studying international public relations. The UNC Charlotte 49er Democracy Experience holds student-oriented events around campus that encourage student participation in the political climate throughout the academic year. Members of the 49er Democracy Experience work to educate students about the value of their voices and how to communicate their opinions through voting. The University encourages faculty, staff and students to take full advantage of opportunities to learn about and get involved in the issues, discussions and democratic processes necessary to shape a productive society.